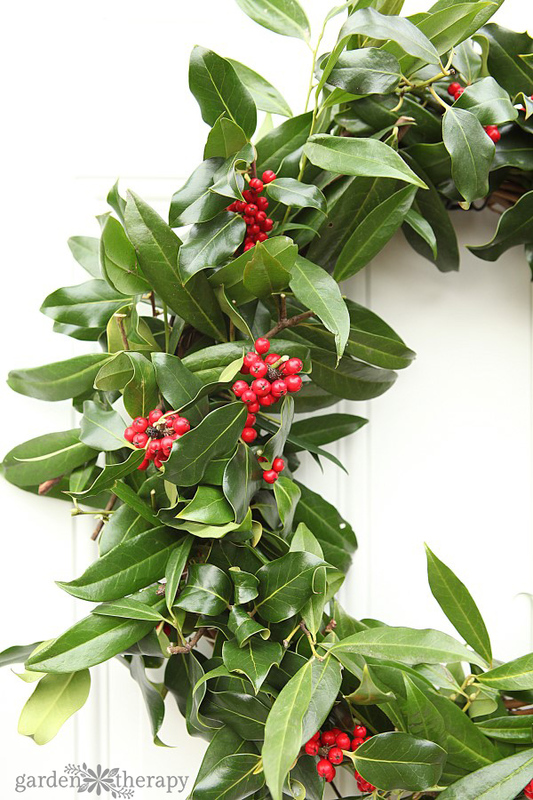 A fresh holly wreath dotted with bright red berries is a traditional way to decorate for Christmas. While I love to play with all sorts of different greens (as well as the whites, golds, yellows, blues, and reds) for my holiday decorations, the 20ft tall holly tree that adorns the entrance of my urban garden explodes with berries that beg to be used in festive arrangements. 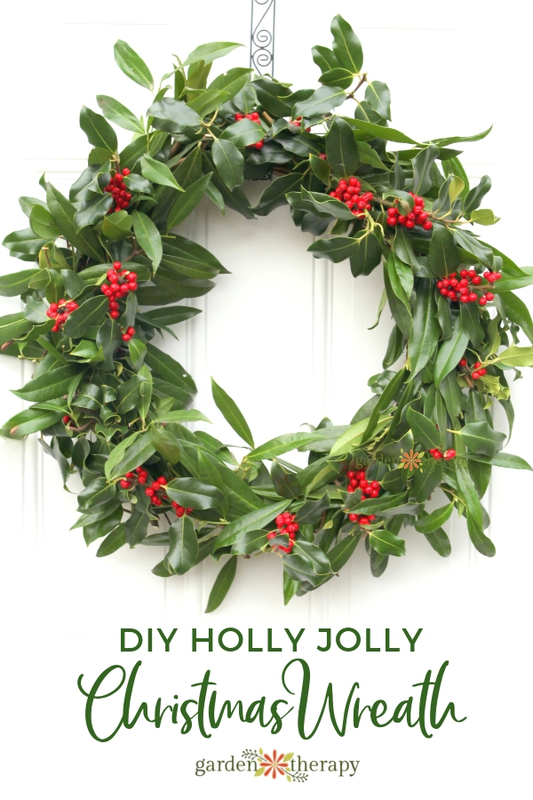 The leaves may be a bit prickly but they are worth a few bandages for the final result of this easy-to-make fresh holly wreath. 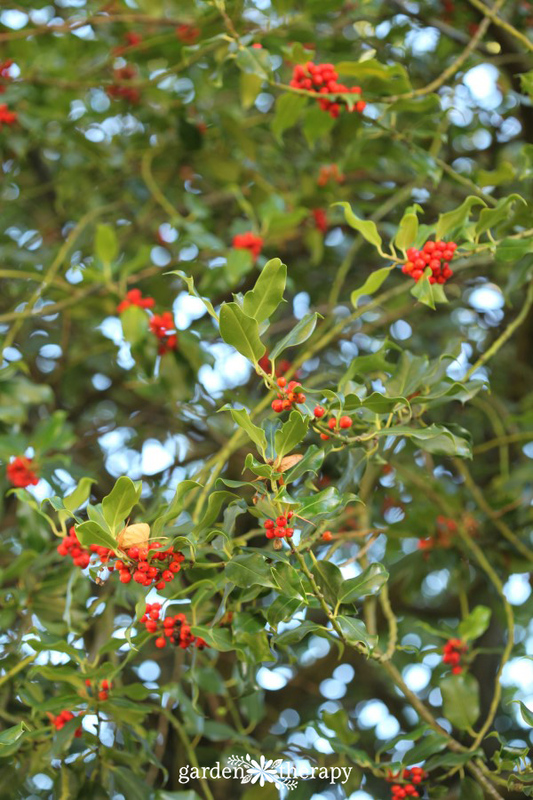 When you think of holly you undoubtedly will associate it with Christmas. If you have one on your property you may also think “Ouch!” and “Ugh!”, the two sentiments I utter when a) getting stabbed by the leaves and b) when I have to clean up the leaves that just won’t compost and pluck out all the volunteers around the garden. Despite how you feel about the prickles, it’s hard not to appreciate the beauty of the glossy green leaves and perfect red berries. Before you get started cutting evergreens from your garden, please have a quick read of my pruning basics article. While I’m all for decorating with fresh cuttings from the garden, it is important to care for the health of your trees and shrub’ health. To make this wreath I took some clippings from the large tree that borders my new garden and the neighboring laurels. 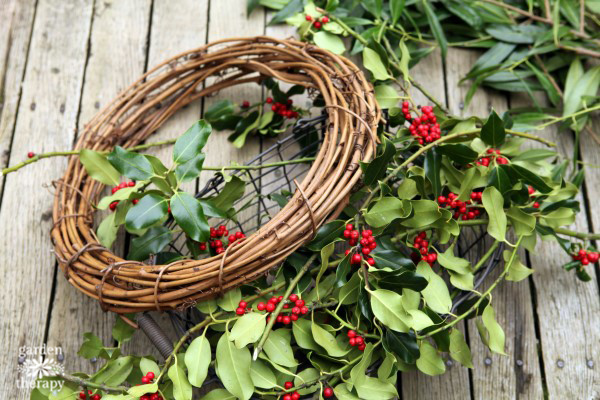 Using the holly, laurel leaves, and a grapevine wreath form, this traditional striking wreath can be made in under 30 minutes. 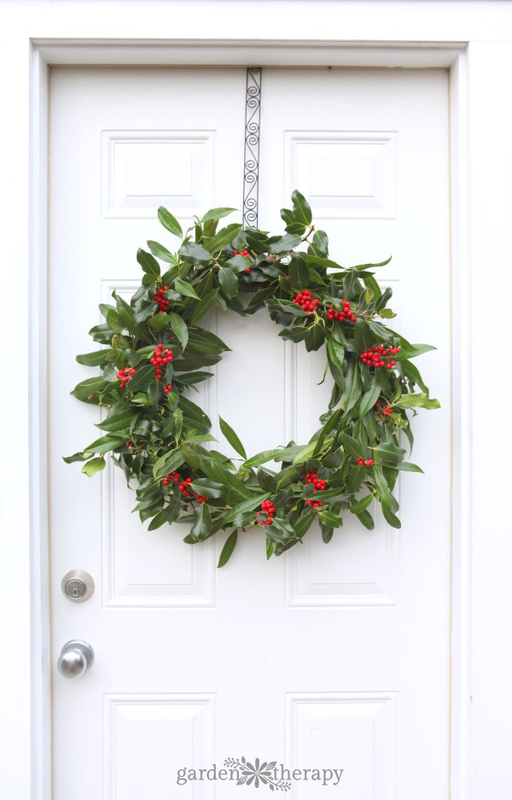 Start your wreath by gathering a bunch of laurel branches. 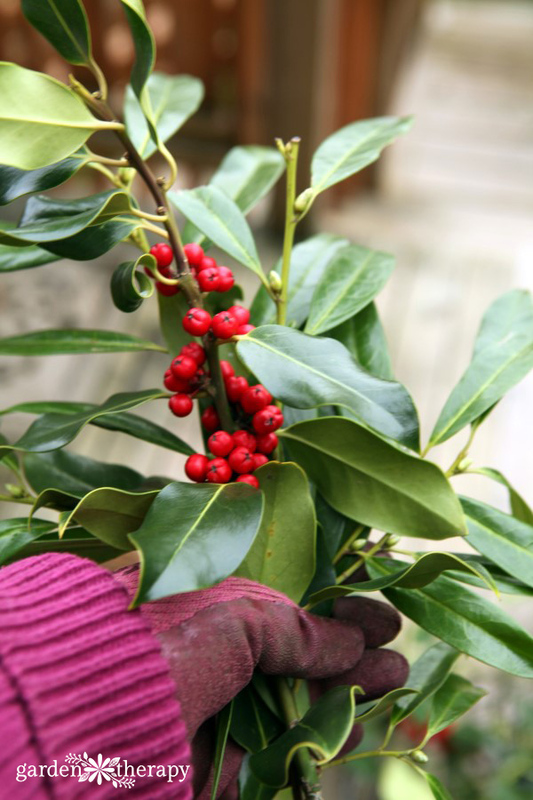 Add one holly branch with lots of berries to the top and trim the bottom of the bunch. Wind twine around the base of the bunch and then around the grapevine wreath. Secure the bunch by tying the twine in a knot, but do not cut the end. Continue by making more bunches like the first one and winding them onto the grapevine wreath with twine. When you come to the end of the wreath, tuck the last bunch under the tops of the leaves of the first bunch then wrestle with the twine and the pointy leaves until you have that last bunch secured. Tie it in a few knots to ensure that everything stays in place. Now have a quick look at the wreath. Are there any unruly bits? 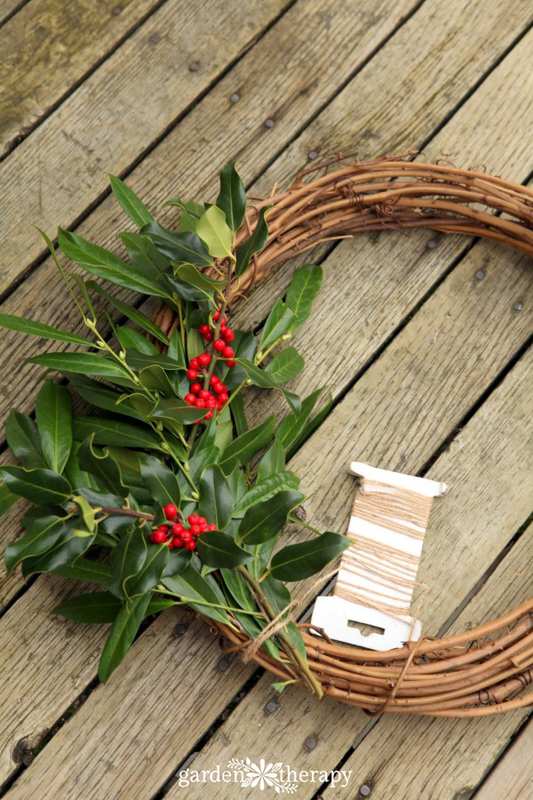 Use your pruners to shape the wreath and tame down some of the wild branches. Hang your wreath up and have a good look at it. Is there more trimming to be done? Are there more berries needed or is there a bare spot? 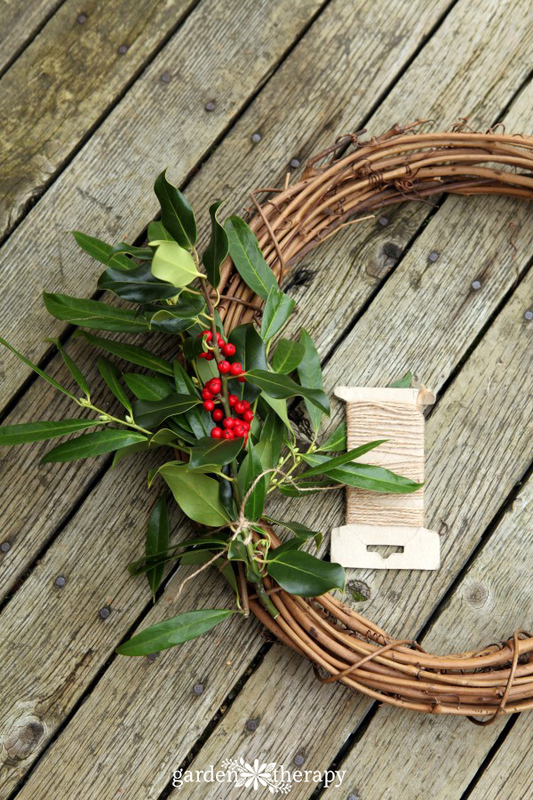 Taking time to make these adjustments will make the most refined wreath. 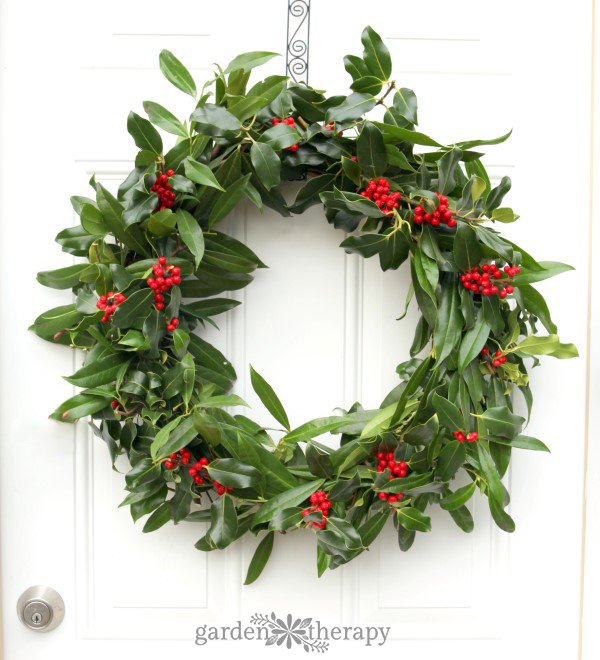 Finally, hang your wreath where you are sure to enjoy it most or to create a festive welcome to your guests. For more inspiration on making fresh wreaths, check out this collection of my wreaths over the years using hydrangeas, lavender, evergreens, eucalyptus, hops, air plants, succulents, and more! How long does it last? How advance can you cut hollyberry?